Screenshot taken from MMO Champion. 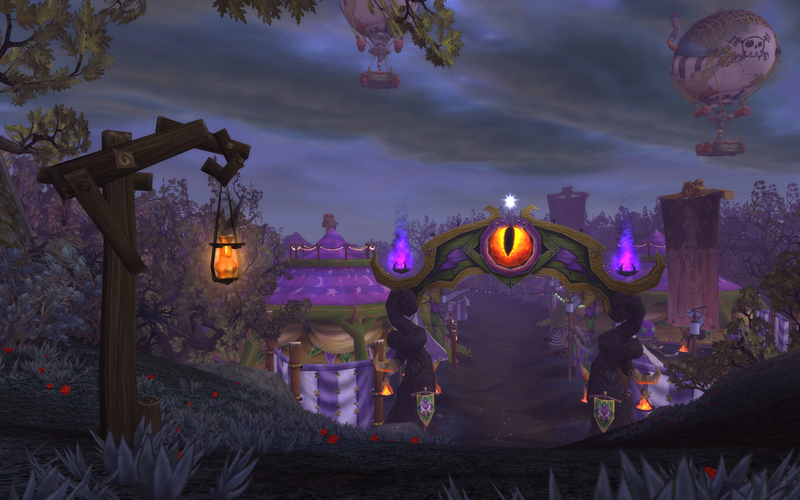 New patch 4.3 news hit today with another doozy – the Darkmoon Faire is getting a revamp! I think this is fantastic, because the DMF is something that’s been ongoing for years but I never really knew what to do with it. I mean, I knew you could buy a few things there, get rep with them or something, turn in decks of cards, etc. but it always felt like something that was from another age. I’ll be honest with you, I love the gypsy and fortune-telling carnival tropes. Back when I played Ultima Online (a billion years ago) I played on a player-run server and my character was actually a fortune-teller. One of the GMs made me a special item that was a deck of cards, and when you clicked it, it became a spread of cards as an accessory for fortune-telling! I had a lot of fun playing that character (and dressing her up in outrageous clothes) so it’s no surprise that a decade later I am excited to transmogrify a carnival outfit and explore the new Darkmoon Faire. Things have changed ‘round here: we’ve got an island all to ourselves now, and what an island it is. Mist-shrouded Darkmoon Island is a conundrum wrapped in an enigma. It has its own island! I love islands. I liked the Island of Quel’Danas (actually known as the “Isle of WTF” in local parlance). It was my first experience with dailies, and I liked the look and feel of it and the self-contained nature of the dailies. You went to the island, you did the dailies, you were done. Tol Barad has been a pale shadow by comparison, although I like it too. Will this island have dailies? I guess they won’t be dailies because it’s a once-monthly thing, but I still like the idea of there being quests. Of course, there’s more to the Darkmoon Faire than just fantastic shows and culinary delights. You can still turn in your Darkmoon Cards, but you wouldn’t just come here for measly ol’ cards when there’s so much more to see, experience, and win. Yes, win! You like dancing bears, right? Everybody likes dancing bears. Even bears like dancing bears. How about a dancing bear… you can ride! That’s not all! We have adorable companion pets includin’ a fez-wearing monkey, a plethora of profession recipes, toys, balloons, souvenirs, delectable carnival snacks and beverages, heirlooms for the little ones, and even replicas of long-lost suits of armor that we’re offering for your Transmogrification needs. You can also make your mark with new achievements and titles. All it takes to earn these fabulous rewards is a few Darkmoon Faire Prize Tickets and a good reputation with the carnies. How do ya get your grubby mitts on some tickets? I’m glad you asked! I read this, and all I see are: mounts, pets, achievements, titles. Yes, I can’t help that I am an achievement hunter and an avid collector. Something new to chase? I’m there. Also, not to be overlooked: long-lost suits of armor. Blizzard had said they wanted to make available some sets that were no longer obtainable in the game. I think this is an elegant way to do that; it still works within the game world and it makes sense that the DMF may have acquired that kind of thing in their travels. Expect to work hard to obtain them (or pay out the nose), though. I don’t think they’ll be willing to part with their collection easily! You won’t have to go too far out of your way to get ‘em and each month you’ll get a new opportunity to seek out an Artifact for us. What do you get out of the deal? Don’t you worry, you’ll get your cut. When you bring a Darkmoon Artifact back to us, you’ll get valuable experience (it builds character, you know! ), earn a better reputation, and possibly earn precious Darkmoon Faire Prize Tickets too! Oh, did I mention that you can use the Field Guide to get to Darkmoon Island whenever the Darkmoon Faire’s monthly extravaganza is up and running? Artifact collecting? Well, it’s obviously going to be part of the rep grind with DMF, and that’s okay…I just hope it isn’t a bunch of random junk that will clutter up my bags. I have enough of that already. Maybe you’d like a little peek behind the scenes, eh? Want to see what it takes to run the greatest show on Azeroth? Well, it’s not all sunshine and cotton candy, my friend. There are beasts to heal, food to cook, and buildings to fix. If you’re willing help keep the show going and put your skills to work, you’ll not only impress us, but you can get experience, Darkmoon Prize Tickets, and even polish up your skills — up to five skill points per profession, per Faire week, if you’re good at what you do! This is a little bit random, but I really hope that this isn’t going to include the “seedy underbelly” of the DMF. Disreputable carnivals and circuses are generally known as places where animals are poorly treated, suffer rough conditions, cruel training, etc. I haven’t been to an actual circus since I was really little. Maybe I’m basing too much of my bias on scenes from Dumbo, but they do give me an iffy feeling. (With the notable exception of the Cirque du Soleil, which only has human performers that chose to be there). Anyway – I just hope there are no bears in tiny cages. I doubt it’s something Blizz would take a chance on, but I suppose you never know. Darkmoon Mages in capital cities and on Darkmoon Island will also be around to help you get between the Faire and various capital cities. There’s no such thing as a free lunch, so naturally you’re obliged to compensate them for their services. No mage comes free, but you knew that, right? Overall, I think that the new and improved Darkmoon Faire sounds like fun! I’m looking forward to seeing it, playing some silly games, adding some mini-pets to my collection, and hopefully having a new island that I enjoy as much as I once enjoyed the Isle of WTF. I enjoy things like torch tossing, juggling and throwing, though – and also the Plants vs Zombies mini-game, so this is right up my ally. Your mileage may vary!